Protestors run through the street before the inauguration of Donald Trump. Police officers push a group of demonstrators back in Northwest Washington, D.C., on Friday. Violence broke out in the area among a crowd of several hundred, but the city's interim police chief says protests across the city have been largely peaceful. 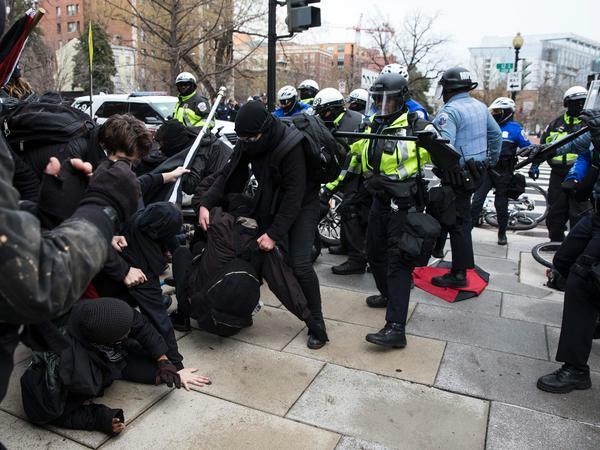 An inauguration protest in Washington, D.C., turned confrontational on Friday, as several hundred black-clad protesters broke windows and police responded with pepper spray and a concussive device. The interim chief of the Metropolitan Police Department, Peter Newsham, said 217 protesters have been arrested, and 6 officers sustained minor injuries. Newsham, in a late afternoon news conference, said those arrested will be charged with rioting. He added that most of the protestors were peaceful, but that a small group of people seemed intent on creating mayhem. "They began to destroy property and throw objects at people and through windows. A large percentage of this small group was armed with crowbars and hammers. Vehicles and store fronts were damaged. ... [It] appeared the activities of this small group were organized and intentional," he said. Of the 6 officers who were hurt, 3 sustained head injuries. Much of the violence broke out in Northwest D.C., not directly along the parade route. During clashes between police and protesters there, officers have used pepper spray in attempts to contain the protests, reports Patrick Madden of member station WAMU. Patrick says that earlier in the day, protesters were running through streets, breaking windows with hammers and knocking over trash cans. 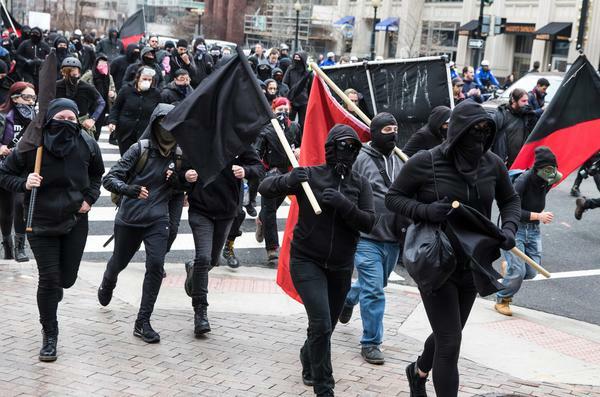 He says police, some wearing riot gear, chased the protesters on motorcycles and used the pepper spray and an unidentified concussive device to subdue the demonstration. At one point, a group of protesters charged and broke the police line, Madden reports. Newsham said officers used pepper spray to protect themselves. Video from the area, posted by veteran protest live-streamer Tim Pool, showed police tightly surrounding a group of people coughing from the pepper spray. Several people on the video identified themselves as lawyers who were observing the protest and said they were not participating in the protest when they were caught in the group of people being hemmed in by police. The self-identified lawyers in the group were particularly vocal that their detainment was unjustified. Meanwhile, at checkpoints along the parade route and sites around downtown D.C., supporters of President-elect Donald Trump gathered to celebrate the inauguration, while other anti-Trump protests continued peacefully. Protests at the Navy Memorial — closer to the middle of the parade route — are loud but peaceful, according to NPR's Pam Fessler. She reports that protesters are lined up along the route, across the street from Trump supporters, to ensure their "voices are heard" when Trump passes by. "Black Lives Matter protesters have positioned themselves outside D.C. police headquarters, according to NPR's Joe Shapiro. Janaya Khan ... led a group of about 80 people in a chant saying, 'That is not my president.' "
At around 11:30 a.m. 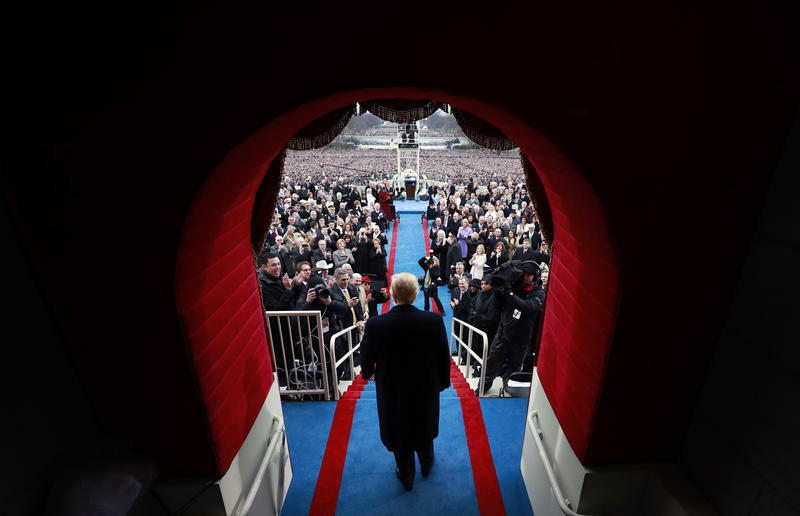 ET, a Secret Service spokesman said all demonstrations are "under police control," NPR's Brian Naylor reports. 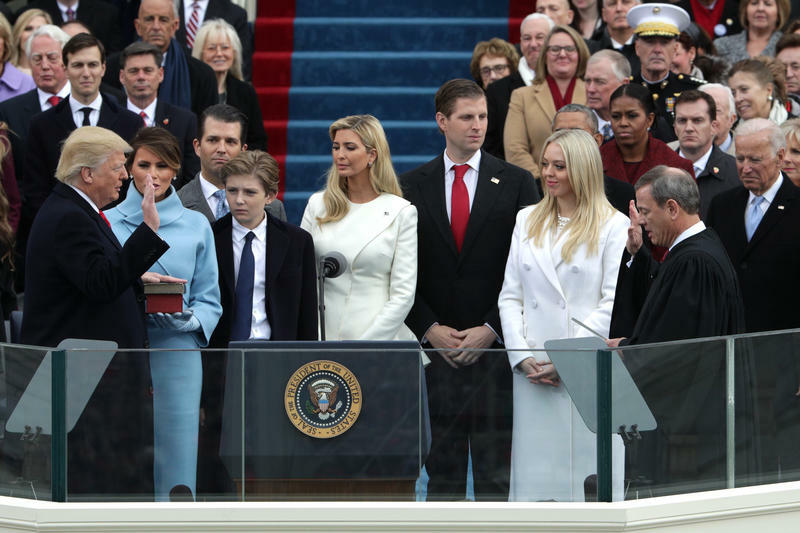 Follow NPR's live blog of Inauguration Day for news highlights, analysis, photos and videos from Washington, D.C., throughout the day.